This week seemed to go by quickly, and the weekend is here again and I am ready for some adventures, lol. We are going to explore a new area in Connecticut and see how the foliage is, then we can decide if we need to go up or down from there. 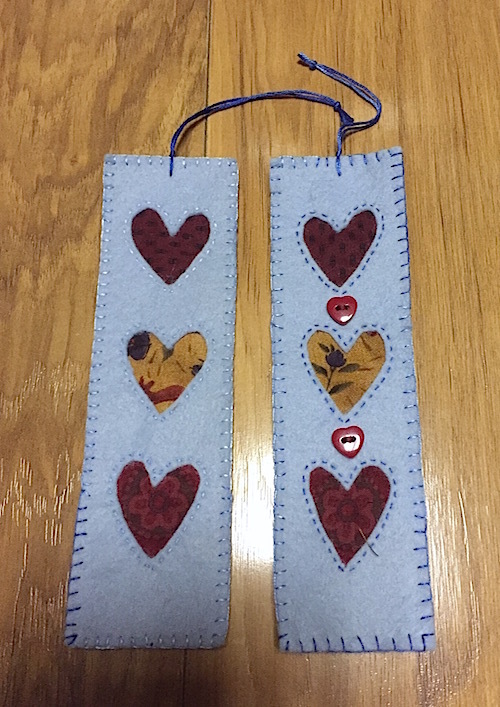 Of course I always have to have something to keep my hands busy during the week so I decided to try some bookmarks. And of course, I cannot follow directions, to save my life, so mine are a bit simpler. I wanted to try them first to see how it worked and they were fun and quick to make. I may try the next with machine sewing on the edge, so I can put in a nicer ribbon. I used fabric from my scrap box and felt that I had won, lots of it to use up and it is perfect for bookmarks. They also have a stiffer felt at the craft store which would work nicely for this. I did a stiff kitty with it and use wool appliqué on top of that and it sews nicely. The pattern is free at Craftsy, and it would be nice in appliqué too. This would be fun to leave in libraries and a tag can be easily attached with floss. If you are good at machine embroidery, you could make a tag for the back. 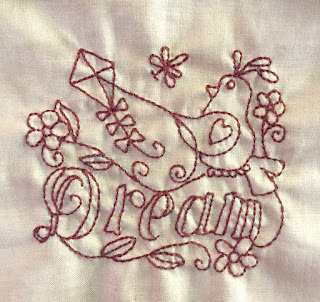 I do need to learn how to use my machine, I love the idea of making my own tags. The bookmark is 7" long. Two pieces of wool are attached with a blanket stitch. I would like to try some of my own designs that the girls can use to make for others and if you are interested, you can join in at DSmiles4Miles on Facebook. If you are interested, please fill out the questions, that lets me know you are a real person. Someone has made a request, but when I click on her Facebook page and there is nothing there, so it makes me suspicious. Another item I finished was another block from Suzy's Sitcom, called Words of Wisdom. I skipped last months but I did like this one, so I will see when it is done, I like having an odd block so I can add my own saying and name for the recipient. I am also working on another large stitchery and started a project from Cheri's Facebook group. She is so wonderful with sharing her patterns and making new ones for us to have for free, even though she is going through her own struggles right now. I hope you all have a wonderful weekend, filled with adventures, and creating. Love the bookmarks, what a great idea. The stitchery is darling! Your stitches are so even on the red work. you are always busy creating. Love the book marks such a great idea to leave them at the library. Debbie, those bookmarks are darling and what a wonderful idea to make some up and put them in the library!! Nice thought!! Love the bookmarks! What a fun idea to leave them at the library. You have so many great ideas for creative items. Wouldn't it be handy to come across one of those bookmarks at the library.